We have left China a few days ago but because of government’s ban on media that could possibly free up people’s minds and cause unnecessary disturbance to the nation I was unable to access my wordpress blog. Thankfully Instagram seemed to be working fine, so at least I could keep it going by posting endless photos and developing my hash tag addiction. 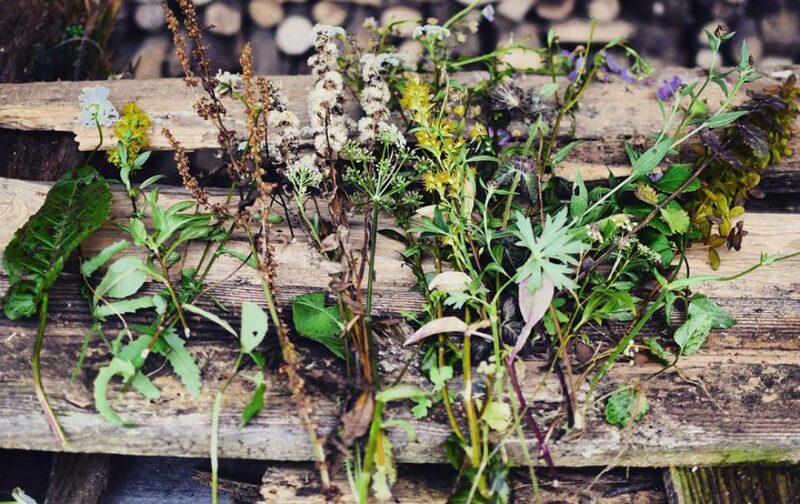 But now I’m back to the blogging business and in the next few post I will quickly wrap up our last months adventures. 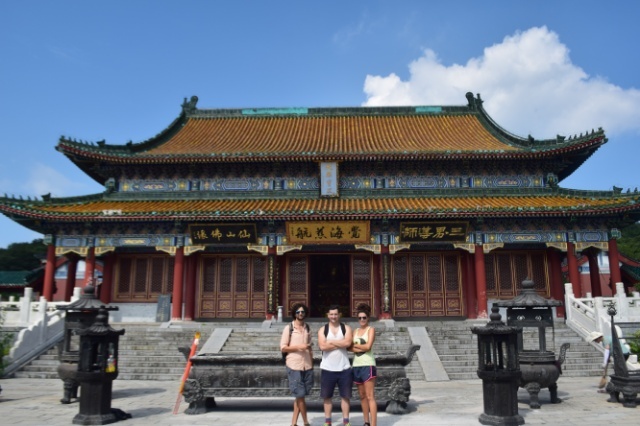 After a bit of a drama with leaving Honk Kong (read about it here), we arrived at the border with no issues, but the moment we were ready to cross onto China we realised that one of the bags we carried was left on the HK side of the border. And it was an important bag as it contained precious food for the journey ahead. Fruits, biscuits, eggs tarts and cured meat. Too much good stuff to waste, call me greedy but when your budget is tight every penny matters, hence off I went for a search. I soon found out that going back on myself on a border crossing isn’t really something you should do and after getting stopped by security and explaining (I mean drawing things in the air with my hands) my sad situation, I surrendered my passport hoping I can go back to HK and quickly pick up what belonged to us. 20 minutes after I handed in my passport I got a little bit nervous as the person who assisted me at the beginning was nowhere to be seen. Eventually I got my passport back and proceeded back to HK crossing. I don’t think I was too surprised to discover that the bag was no longer there. With no food and no cash in our wallets we boarded on an overnight train to Changsha, where we arrived delayed by 4 hours the following morning. 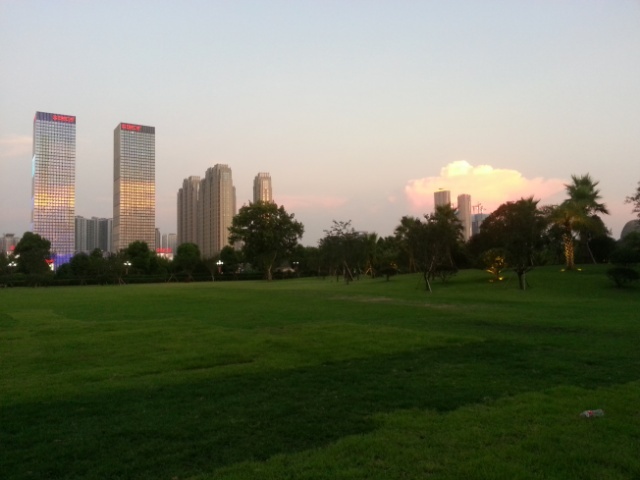 Changsha is not a tourist destination but it was Tim’s brother Jamie whom we paid a visit. It felt a bit weird to be back in a developed city, almost like we were cheating on the idea of backpacking! The city of Changsha appeared to be very modern with a lot of smog, plenty of universities and country’s biggest fireworks factories, which greatness can be witnessed on Saturday nights when a firework show is on for everyone to enjoy. 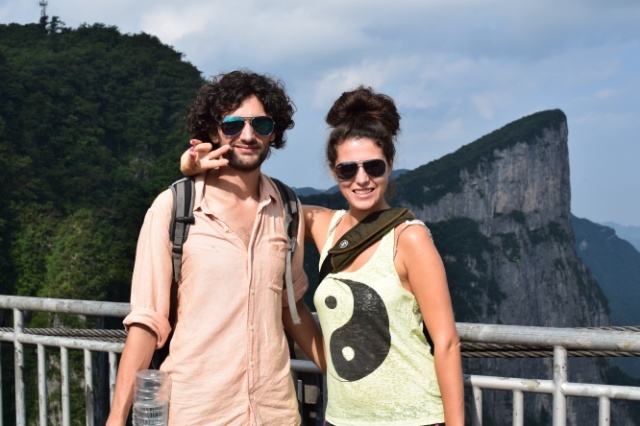 But of course we did not plan to spent the whole month we had in Changha and after few days of our arrival we were ready to set off together on our first trip to Tianmen Mountain National Forest Park and Zhangjiajie National Park. 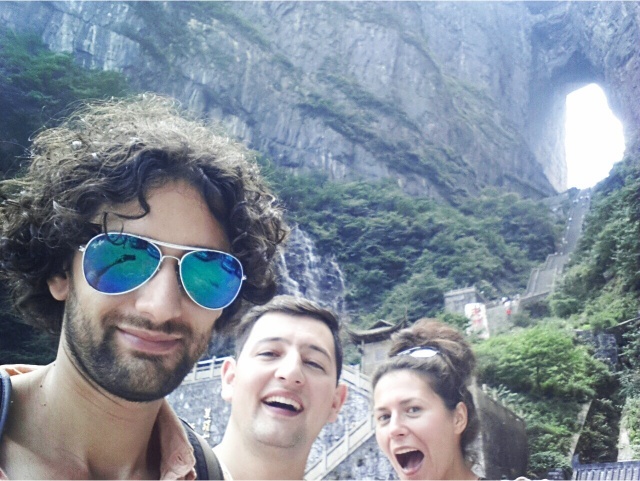 Tianmen Mountain sits above the city of Zhangjiajie with its highest peak at just over 1500 meters. 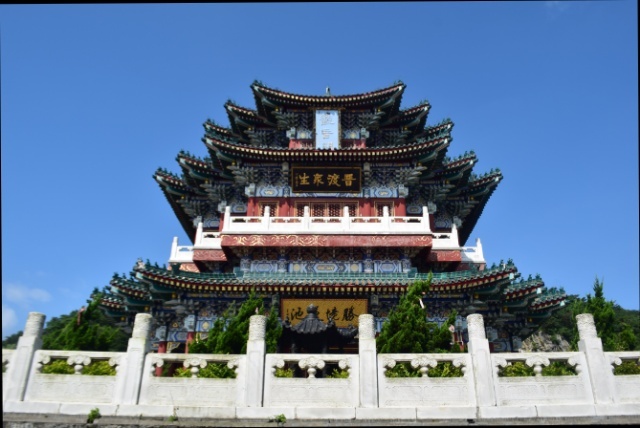 The mountain is named after the massive cave half way up the mountain that looks like a gate to the heaven, hence, the name Heavenly Gate Mountain. Prices for accessing this national park are heavenly high too, so if you are on a tight budget be aware! In order to get to the heavens gate a rather hell like ride along 7.2 km cable car is required and believe me it does make the hair on your arms stand up. 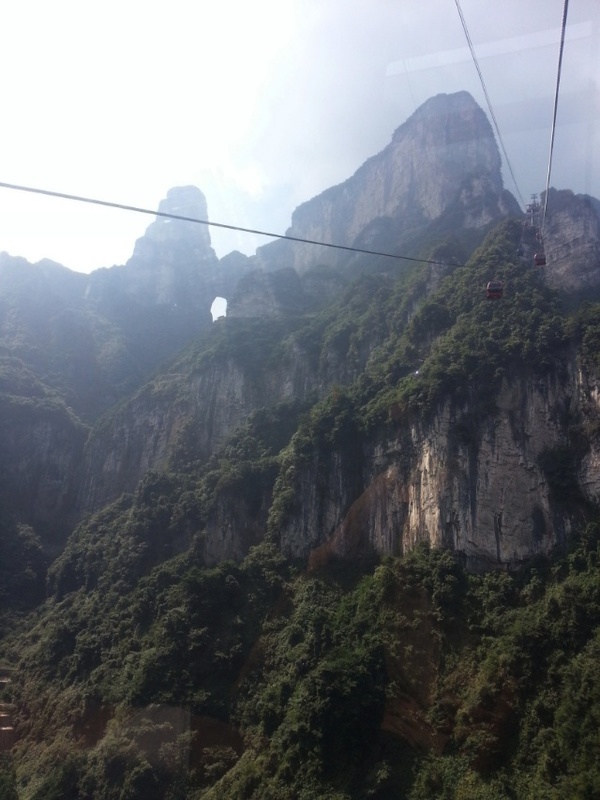 The Chinese have claimed it to be the longest cable car across high mountains in the world, which may be the truth or it may as well be the longest cable car across high mountains in the world, in China. 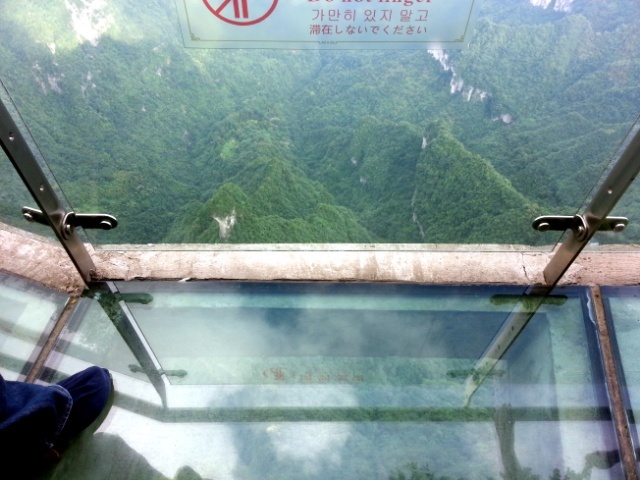 Regardless of that the views are spectacular, if you can actually be brave enough to look down. Once you get over your fear of hight another scary adventure awaits in front of you, a Walk of Faith, a glass path sitting on the edge of the cliff. 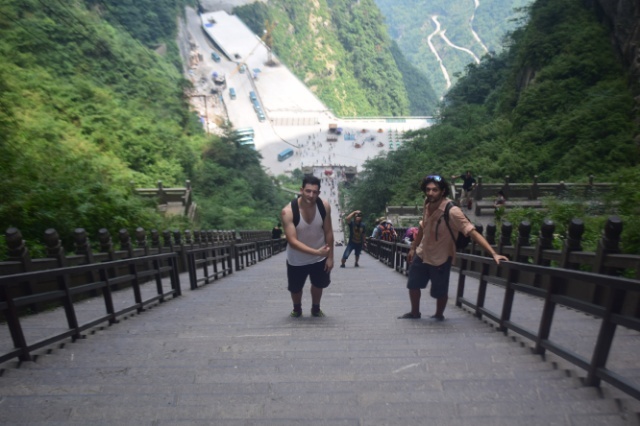 Boys chickened out much more than I and if anything I found Chinese tourist cramping in one spot taking endless photos much more scarier than the walk itself. Another cable car ride away is Heavenly Temple, a 500-year-old Buddhist temple nestled in the mountain. One of the most important temples in the area, the grounds were surprisingly empty and made a nice stop to relax and wander around. Not very often you get the whole temple to yourself! 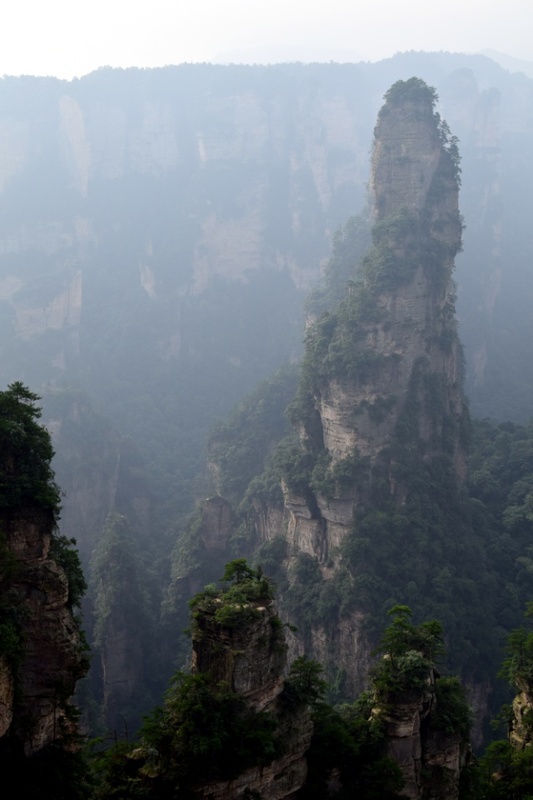 Once we were done with the heavens Zhangjiajie National Park was our next stop. 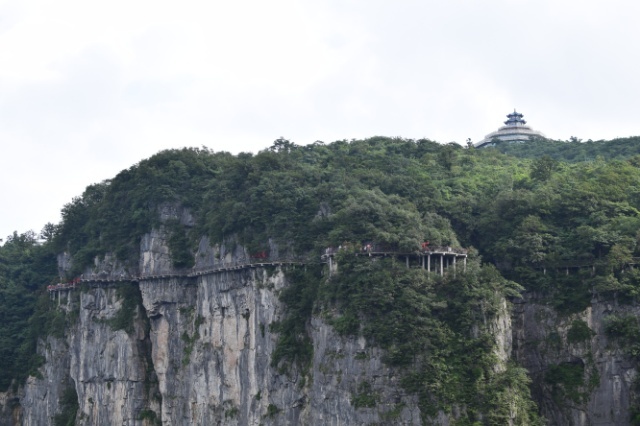 Only an hour away on a bus from Tianmen Mountain National Forest Park, the park has been marked as AAAAA attraction and being the part of Wulingyuan Scenic Area is recognized as a UNESCO World Heritage Site. 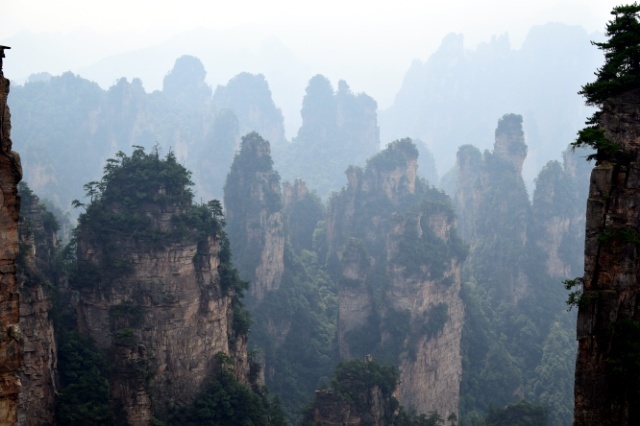 Zhangjiajie’s popularity became even bigger with tourist after 2012 when Chinese declared that the park was an inspiration behind the movie Avatar and the tacky photographs with the Avatar creatures photo-shoped can be taken by the main view points. Sad I know but local tourists seem to like it. The transport within the park is via buses and thankfully this is included in the ticket price. We spent the night in a hostel on the parks grounds, so that we could make the most of the two days we had left. The weather seemed to work in our favour too and the cooler mountain air felt much refreshing. Starting our walks early in the morning meant that we avoided the heat of the midday sun but also the sites we wanted to see were likely to be less crowded. The fog hovering over the giant rocks rising from deep valleys making the photo opportunities not so great, but with a bit of imagination I could see how fabulous this place must look like with a better visibility. Or maybe the fog made it look more mystical, hence the idea for Avatar?! « Hong Kong on the go! 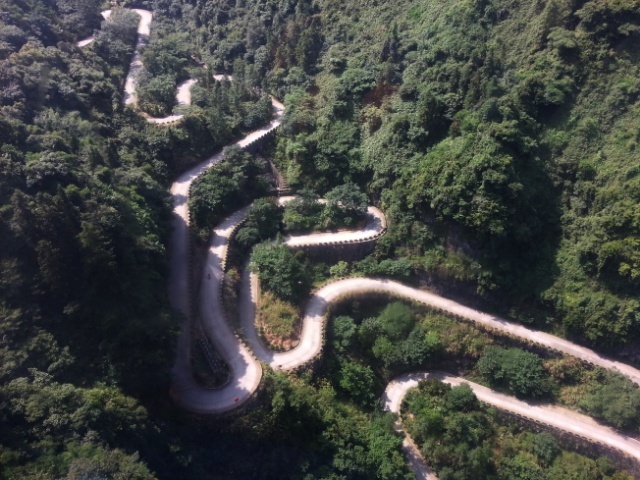 Amazing place….nice writing and some awesome clicks….